Head-on car collisions are one of the most fatal types of car accidents on U.S. roads. Here are three tips to pass another vehicle safely to help you avoid a deadly car accident. Check to make sure the other lane is clear. Never dart out into the other lane of traffic when you have not checked for other oncoming traffic. Use your turn signal. It is always courteous to signal before changing lanes. In addition, signal for a full three seconds before moving over. Wait to fully clear the vehicle you passed before moving back over. Cutting back too quickly could cause you to be rear-ended. When passing a vehicle, pedestrian, or bicyclist on the roadway, be sure to do so safely and in compliance with traffic laws. In general, pass to the left of the vehicle you are overtaking. Make sure to pass at a safe distance and not to return to the right lane until you are clear of the other vehicle. Remember, this applies to pedestrians and vehicles on the roadway or on the shoulder to! Passing on the right is only allowed in narrow circumstances, such as when a vehicle is making a left turn or when there are multiple lanes of travel in one direction. Finally, be sure to abide by no passing zones and pass only when you can clearly see that there is no oncoming traffic; passing when the view is obstructed is illegal and can cause a serious collision. The driver of a vehicle overtaking other traffic proceeding in the same direction shall pass to the left thereof at a safe distance and shall not again drive to the right side of the roadway until safely clear of the overtaken traffic. The driver of a vehicle approaching a pedestrian or bicycle that is on the roadway or on the right-hand shoulder or bicycle lane of the roadway shall pass to the left at a safe distance to clearly avoid coming into contact with the pedestrian or bicyclist, and shall not again drive to the right side of the roadway until safely clear of the overtaken pedestrian or bicyclist. Except when overtaking and passing on the right is permitted, overtaken traffic shall give way to the right in favor of an overtaking vehicle on audible signal and shall not increase speed until completely passed by the overtaking vehicle. 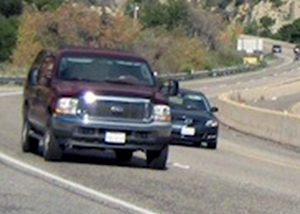 Upon a roadway with unobstructed pavement of sufficient width for two or more lines of vehicles moving lawfully in the direction being traveled by the overtaking vehicle. The driver of a vehicle may overtake and pass another vehicle upon the right only under conditions permitting such movement in safety. Such movement shall not be made by driving off the roadway. No vehicle shall be driven to the left side of the center of the roadway in overtaking and passing other traffic proceeding in the same direction unless authorized by the provisions of RCW 46.61.100 through 46.61.160 and 46.61.212 and unless such left side is clearly visible and is free of oncoming traffic for a sufficient distance ahead to permit such overtaking and passing to be completely made without interfering with the operation of any traffic approaching from the opposite direction or any traffic overtaken. In every event the overtaking vehicle must return to an authorized lane of travel as soon as practicable and in the event the passing movement involves the use of a lane authorized for vehicles approaching from the opposite direction, before coming within two hundred feet of any approaching traffic. When a bicycle or pedestrian is within view of the driver and is approaching from the opposite direction, or is present, in the roadway, shoulder, or bicycle lane within a distance unsafe to the bicyclist or pedestrian due to the width or condition of the roadway, shoulder, or bicycle lane. The foregoing limitations shall not apply upon a one-way roadway, nor under the conditions described in RCW 61.100(1)(b), nor to the driver of a vehicle turning left into or from an alley, private road or driveway. The state department of transportation and the local authorities are authorized to determine those portions of any highway under their respective jurisdictions where overtaking and passing or driving to the left of the roadway would be especially hazardous and may by appropriate signs or markings on the roadway indicate the beginning and end of such zones. When such signs or markings are in place and clearly visible to an ordinarily observant person every driver of a vehicle shall obey the directions thereof. Where signs or markings are in place to define a no-passing zone as set forth in subsection (1) of this section, no driver may at any time drive on the left side of the roadway within the no-passing zone or on the left side of any pavement striping designed to mark the no-passing zone throughout its length. This section does not apply under the conditions described in RCW 61.100(1)(b), nor to the driver of a vehicle turning left into or from an alley, private road, or driveway. When you’ve been in a car accident, turn to the expert car accident attorneys at Parke Gordon Law Firm to handle your case. The lawyers at Parke Gordon Law Firm have handled hundreds of car accident cases. We believe every client deserves top-tier representation. Call our Spokane law office today for a free consultation at (509) 482-7274.